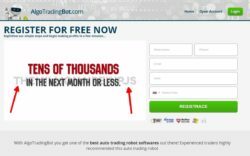 While doing the review of a binary options scam called „Algo Trading Bot“, we discovered one of the roots of these trading robots. Algo Trading Bot uses a video presentation that has just been copied from another scam called TheMillionaireInPJS. So scam recycling is going on. In the video you can hear that you will make tens of thousands of dollars within the first month. And you guessed it, becoming rich is as usually free, AlgoTradingBot is no exception to this golden rule. When we tried the Algo Trading Bot we immediately recognized a familiar app. Indeed, it is the exact same app as used by the Option Robot scam. When reviewing this scam, we made a video to show how the demo is faking results, see below this bot in action. So this is becoming a fairly ordinary trick of scammers, they provide you with a fake demo that makes you believe that the system really works. But when you then open a real account and deposit money, real results cannot be faked and you will be losing your money. But by then scammers will have their affiliate commission from their broker, so they will no longer care about you. This is how these scams work. 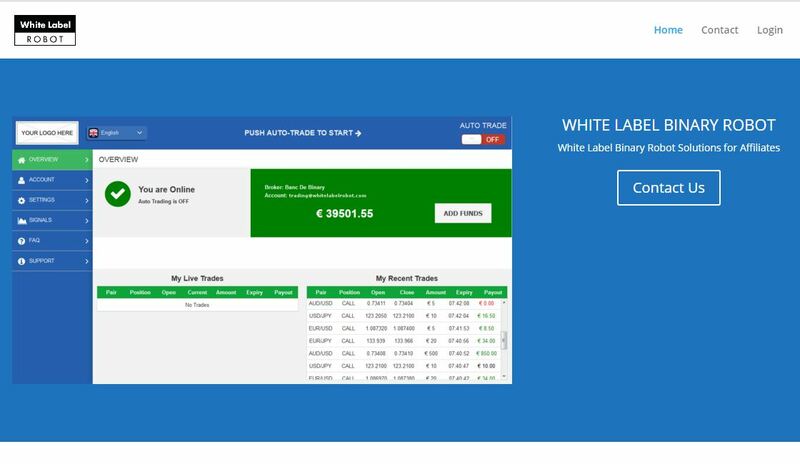 And Algo Trading Bot is obviously based on a white label binary option robot. We have discovered who is providing this robot to scammers, it is White Label Robot. Look at the picture on the right, anybody can purchase this robot, put in their own logo and begin to scam people. So we guess that it is not the last time we see this robot, different names will very probably follow. Algo Trading Bot is a scam that is trying to fool you with a fake demo, so don’t invest your money with it. You can try a real demo to see how binary options really work and what it takes to become profitable. You have to learn trading and build a profitable strategy. Found this site a little too late. whitelabel site info came up after logging in when it asked about saving password. but didnt really pay attention. 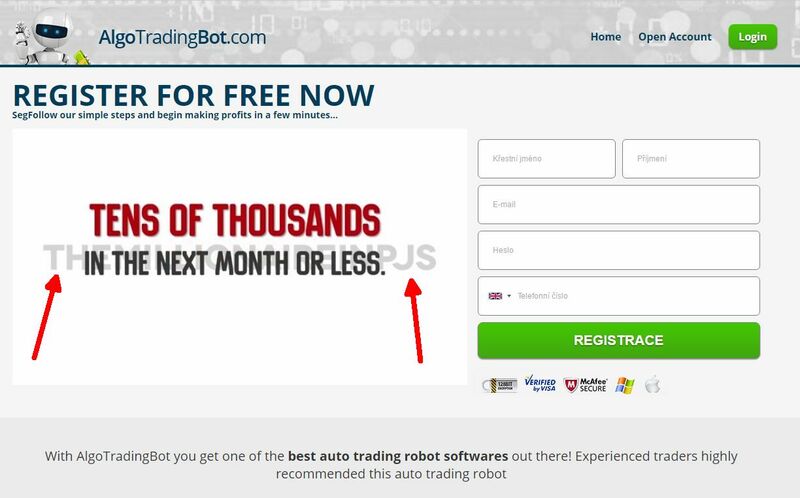 searched for algotrading but found no real comments on this robot and was foolish to sign up on recommendation of a binary option site which exposed scams. did a demo mode and signals seemed to agree with charts directions and lost one trade out of about 20. switched to real mode and won 7 out of 20 losing over $150 in a few minutes. definitely a scam. can’t contact by e-mail. no phone number, no stop loss setting as was mentioned in sales pitch. no info on page with FAQ. disappointed to see that reputable brokers are signed up with this scam ware. good call…. to be honest i created a wrapper around xpertoption.com cause i was almost fooled that it was legit. tried the signals with iq option (fully automated. I get the signals, and based on them i place either call/put or i wait) cause i didn’t want to start with 250$ (good thing i tried it with a demo account and not real money…) almost 95% of all those trades are losses. during my scrapping i discovered that xpertoption gets its signals from an ajax call to whitelabelrobot.com. I was shocked, i mean with xpertoption i was winning using demo account, but when using their signals on a broker (yeah i kinda trust IQ Option’s data) it was all loses. so i searched with whitelabel robot that’s when i found this article. to all the visitors here, i know most of you aren’t tech-savy, but do learn how the system works (any http analyzer works, i won’t promote any) and as soon as you see “whitelabelrobot” RUN!